Cirra Networks is one of the largest and most diverse internet service providers in North Texas with all operations in Fort Worth. We provide our subscribers with a high quality internet experience and responsive customer care. We don't rely on just one technology to bring you the service you want. With over 4,000 square miles of high speed wireless service area, and DSL, ISDN, and Dial-up, we have the necessary technologies to get you internet service when other providers cannot. 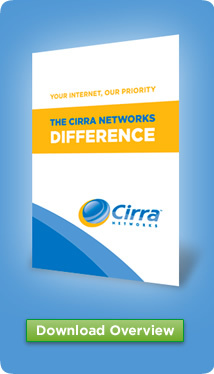 Cirra Networks is all about service. We connect to you, you connect to others, and businesses connect around the globe. Learn, Surf, Email, Play, Work, Communicate, Shop. We put the world at your fingertips. Our Customer Testimonials show how we strive to deliver satisfaction every day. Cirra Networks is proud to make some of the most advanced wireless Internet technology available to residents and businesses in its service area. The technical term for our service is "Fixed Wireless Broadband Internet," which is exactly what the name implies - high speed (broadband) Internet service without wires, fixed to specific locations (i.e. not intended to be mobile). 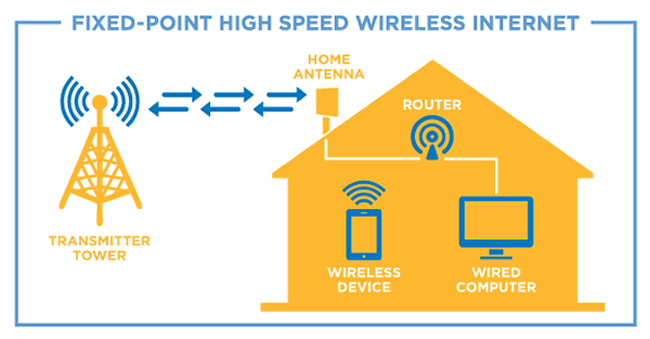 Unlike traditional terrestrial high-speed Internet solutions, which are delivered over telephone wires or television cables, our wireless high-speed Internet travels by radio waves from our network center to your location. This system utilizes a hub-and-spoke-like topology that is composed of multiple relay and repeater sites. This method effectively compensates for the hilly topography of our region. The end-point of the system is at your residence or place of business, and consists of a small outdoor directional antenna mounted so that it faces the nearest repeater site. This low-voltage customer-premises system is powered over the same cable that carries the data signal (using "Power Over Ethernet") from the outdoor antenna indoors to your computer, hub, or router. Our technology employs several radio bands between 900 MHz and 5.8 GHz that have been allocated by the FCC for wireless data services. By utilizing different frequency bands for different legs of the network, we can maximize the data carrying capacity and performance of the system. Do not confuse our technology with basic low-cost "Wi-Fi" - the technology commonly used in homes, businesses and public locations to allow laptop computers or PDAs to be wirelessly connected to the Internet. Our equipment is very sophisticated and utilizes a number of techniques that solve common wireless Internet problems such as radio spectra noise, interference from other wireless devices, and collisions of data packets caused by heavy usage from a large number of subscribers. Cirra Networks is made up of a growing list of member companies. Collectively, we have been servicing customers in North Texas for decades and our employees have actively supported many local organizations over those years. Companies who become certified by Cirra Networks use the Member logo to indicate their affiliation with our growing network. The effort we make to service our customers is reflected in their Testimonials. No other regional provider in North Texas strives as much as we do to treat you like our only customer. Wireless Internet Service and DSL Internet in Fort Worth and North Texas counties including Tarrant, Johnson, Parker, Hood, Wise, and Palo Pinto.